Python tool that allows users to quickly view and explore microscopy data; generate reproducible analyses, encoding a complete history of image transformations from raw data to final result; and scale up analyses from initial exploration to high throughput processing pipelines, with a minimal amount of extra effort. 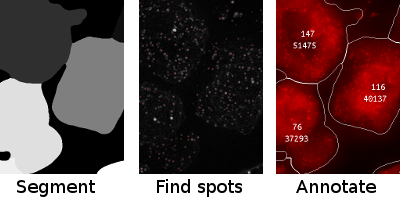 Software to assist with the enumeration of single molecule RNA probes. 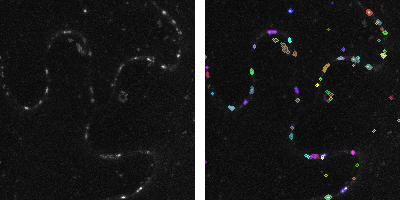 It operates on microscope data files, eventually outputting an annotated image showing a projection of the data with suggested cell boundaries and probe counts and areas (in pixels) for those cells. This code implements a quantitative image analysis pipeline for the reconstruction of root cell volumes from confocal microscopy data. 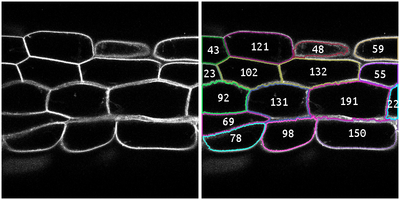 These reconstructed cell volumes can be used to measure fluorescence intensity in other channels in the confocal images. Extract stomata shape descriptors from bright field micrographs. In particular the code looks at the intensity profile across a number of brightfield z-slices to work out how open a stoma is. Images have a disk in the centre, a halo of yeast death radiating from it, and then a thick yeast lawn. The code quantifies intensities in lines radiating out from the centre to illustrate differences between mutants in an unbiased manner. 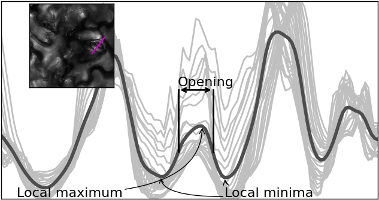 The plot on the right shows line profiles from different mutants. Script to aid in the quantification of the number of germinated vs ungerminated pollen grains. The script identifies and counts both the number of pollen grains and the number of pollen tubes. By subtracting the number of pollen tubes from the number of pollen grains the number of ungerminated grains can be quantified. 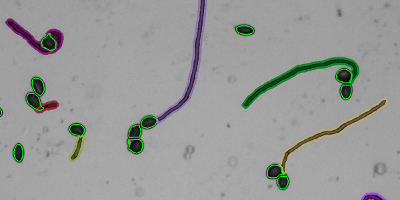 Images contained marker identifying callose deposits abundant in plasmodesmata and stomata. Working on the 3D stack the bioimage anlaysis identified spots that were likely to correspond to plasmodesmata and calculated a number of descriptors for these regions. 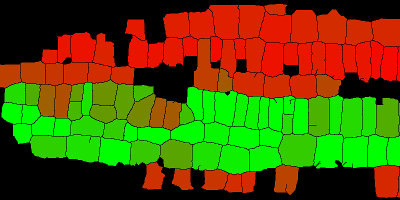 Software tries to segment noisy images of wheat leaves. The key feature of the algorithm is that it makes use of the anisotropy in the tissue structure to improve the segmentation. 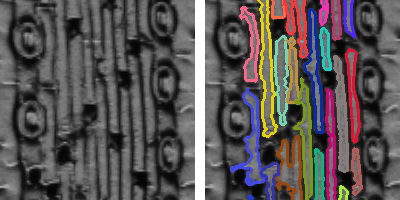 Several filters are applied to remove poorly segmented cells. The resulting segmentation was good enough to get estimates of cell lengths.